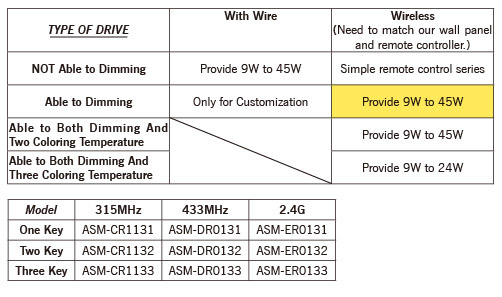 Suitable for house decorations, Argo Smart’s remote control dimmer series is a smart dimming system that responds to the firm’s wall panel controllers, remote controllers, wireless LED drivers and LED light fixtures (including those from other brands), and enables easy adjustment of brightness and color temperature of LED lights. Also notable is that the system obviates the need for cord management products between LED lights and switch panels as an ideal building material option for smart houses. The remote control function of this series can be enabled by both a wall panel controller and remote controller at the same time. This remote controller is part of the remote control dimmer series. 1, the emission frequency: 315 MHZ 433 MHZ 2.4G. 2, remote control distance: standard configuration of 50 meters open (optional with any of the company's remote control). 4, the mode of modulation: GFSK. 5, remote control battery 23A12V. 7, process: UV light oil.